Come and have a great family holiday with loads of outings and things to do before returning at the end of the day to our tranquil farm. See below for our best picks. La Jouachere is situated just outside Queaux ( overlooking the Vienne river valley in the Department of La Vienne (86). Our two rustic style Gites converted from a stone and timber built 1790’s barn feature fitted modern kitchens with fridge freezers, dishwashers and microwaves, and modern clean bathrooms. There is access to a communal washing machine by request. This lovely converted barn Gite offers two bedrooms, one with two single beds and one with a double bed. An additional child's bed is offered in an annexe to the double bedroom. We’ve tried to think of most eventualities by providing everything from well equipped kitchens, free to air British and French television channels and comfy beds and sofa’s, as well as plenty of tranquil outside spaces to get away from it all. If there’s anything missing just ask us as we will be on hand to advise and help make sure your holiday is an enjoyable one. La Jouachere is home to our young family and three years ago we returned here to start our Organic sheep farming business and open the Gites. La Jouachere (La Joinchere on Google maps) enjoys spectacular views over the Vienne valley and occupies a quiet position where you are unlikely to be disturbed by any neighbours during your stay. Ideal location to base yourselves so you can go and enjoy loads of great activities and return at the end of the day to relax in beautiful natural surroundings. We are very happy to share "farm experiences" with young or old alike. Whether it be feeding geese, ducks and chickens, or taking water out to the sheep. We have established the heart of the farm as a nature reserve with the LPO (Ligue Protection Oiseax - a bit like the RSPB). Queaux is nestled into the hillside of the Vienne valley offering 2 bars, a bistro, shop and bakery. The gites overlook the village - near enough to join in but far enough to ensure tranquility. La Jouachere, also known as La Joinchere, commands a spectacular view over the Vienne when you can swim or relax at the buvette in the summer or enjoy the weekly music evenings. The dining area is in the kitchen. Sitting is possible for 6. Please let us know if you require a booster seat for an infant. The gite garden overlooks our farmland which you are welcome to explore. Come and stay - Great adventures in store for children both around and about and on the farm. I took our 2 children (14 & 3) to experience life on a farm. 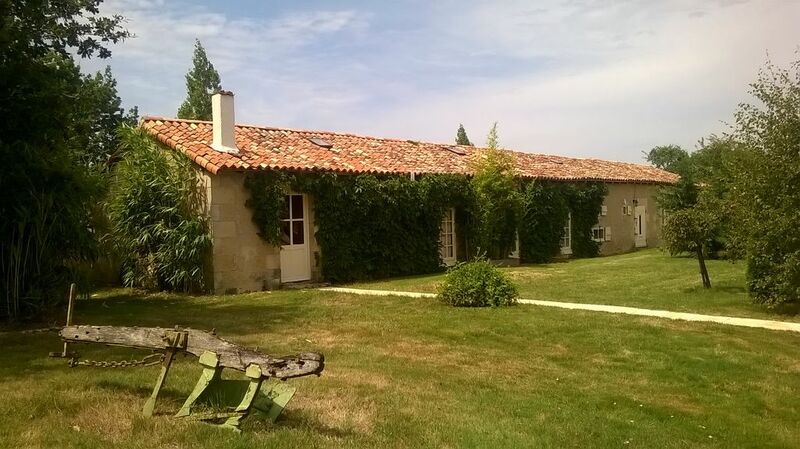 The gite was very comfortable and the environment was friendly. The children were encouraged to help feed the horses and sheep which they loved. The little one found the ducklings fascinating and cute. The surrounding district has some interesting castles, towns and sights. Other attractions further away (and more expensive) are also available for older children and adults. The host family are very helpful and kind. We highly recommend this property for those looking for a quiet farming experience.